Tag line: "The GREATEST ROMANCE and ADVENTURE in a THOUSAND YEARS!" 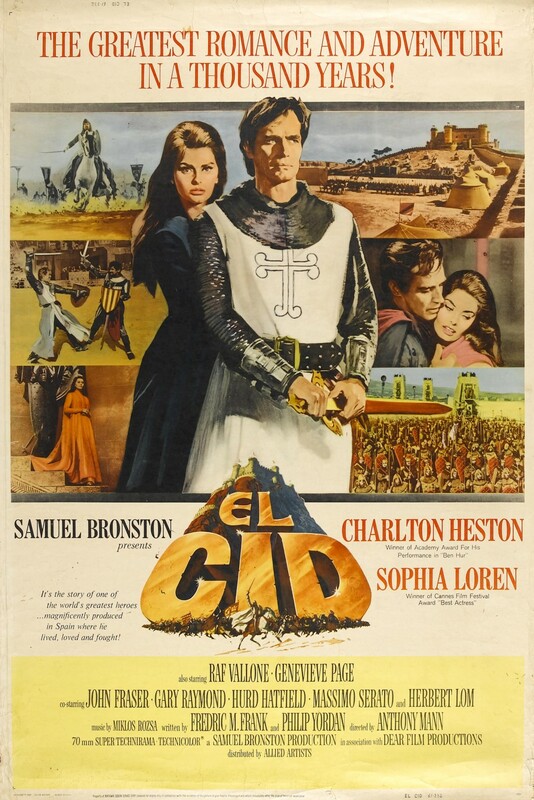 Who else but Charlton Heston could’ve starred in El Cid? Having already played such larger-than-life figures as Moses in The Ten Commandments and the title role in Ben-Hur, he seemed the natural choice to portray the 11th century Spanish knight Rodrigo de Bivar, also known as El Cid, a man whose courage and strength transformed him into a legend. Set in 11th-century Spain, a land torn apart by warring kingdoms, El Cid follows the legendary Rodrigo (Heston), a nobleman of the city of Castille whose bravery has earned him the honorary title El Cid (which is Arabic for “The Lord”). Yet despite his exemplary service on the battlefield, El Cid finds himself at odds with many of his fellow countrymen. After defeating the Moors, he allows several of their leaders to go free, causing some in Castille to brand him a traitor, and leading to a duel between he and Count Gormaz (Andrew Cruickshank), the father of his bride-to-be, Jimena (Sophia Loren). El Cid even refuses to swear allegiance to his new King, Alfonso (John Fraser), because he believes he had a hand in the assassination of his own brother, Prince Sancho (Gary Raymond). In anger, Alfonso exiles Rodrigo, but when the ruler of the Moors, Ben Yussef (Herbert Lom), makes plans to invade, the King realizes the only man who can lead his army to victory is El Cid. El Cid is a first-class Hollywood epic, a movie large in scope with beautiful imagery and, more importantly, a handful of spectacular action sequences. Early in the film, El Cid competes in a contest against Don Martin (Christopher Martin), the champion of the King of Aragon. It’s a lengthy showdown (starting as a joust on horseback and finishing up with hand-to-hand combat), yet never once does it lose an ounce of excitement. Anthony Mann’s steadfast direction aside, El Cid owes much of its success to Heston’s performance. From his very bearing to the way he handles the arduous battle scenes, Heston is every bit the warrior, a commanding presence whenever he’s serving king and country. Unfortunately, El Cid stumbles when the action subsides. While convincing as a valiant knight, Heston’s scenes with Sophia Loren are flat. The two have zero chemistry (which may have something to do with the fact they couldn’t stand working together). This aside, El Cid is a thrilling account of Spain’s most famous knight, portrayed by an actor who was born to play a hero.